Sophie's is an American restaurant offering globally influenced yet decidedly American cuisine. Located within select Saks Fifth Avenue stores, Sophie's offers a dining experience that captures the style and elegance of Saks Fifth Avenue, with a passionate focus on outstanding food and drink. Sophie's Executive Chef Alex Reyes changes his innovative menus seasonally using the best locally-sourced ingredients. The menu is complemented by a seasonal selection of craft cocktails, a thoughtfully curated wine list and seasonally inspired teas and handcrafted sodas. Above all, Sophie's strives to make every guest feel welcomed and delighted every time they dine with us. Long before the advent of so many wonderful American fashion designers, there was a young woman with a sharp eye, profound creativity and a punchy wit. 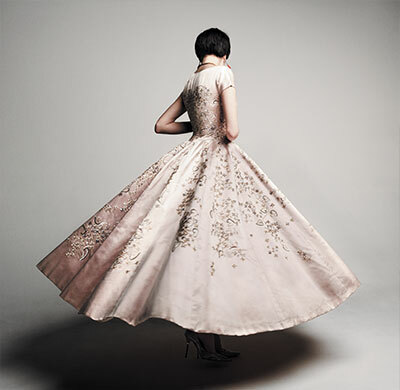 For more than 40 years, Sophie Gimbel presided over couture at Saks. The first American designer (male or female) to grace the cover of TIME magazine (1947), she scoured the globe for inspiration and fabric. But at a time when the fashion world embraced Paris and Milan, and dismissed the U.S., Sophie always returned to New York to design with American style. She was also a savvy businesswoman and an avid gardener (who even canned her own fruits and vegetables). She loved entertaining (at home and at a New York City nightclub in which she invested), embracing a simple style in all she did. And that's the way we like our food! Hand-embellished evening dress with cap sleeves, 1953. Sequined evening sheath with confectionary tulle overskirt, 1958. Chef Alex Reyes oversees culinary development for Sophie’s. Born in Barcelona, Spain and educated at Le Cordon Bleu, Alex trained at some of Washington, D.C.’s finest kitchens — Chez Francois, I Ricchi and Jaleo with José Andrés. 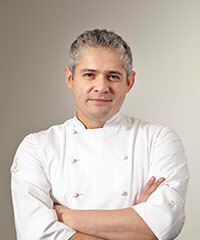 He currently leads the culinary team in the New York City Saks Fifth Avenue flagship store, including Café SFA. Alex was an early proponent of restaurant farm-to-table sourcing and formed strong partnerships with farmers in Maryland and Virginia.